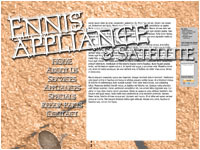 As a gift to the owner, Alfred Haynes hired us to redesign the existing site ennisappliance.com . While the site is complete, it is not scheduled for implementation August 2009, and you may visit the new ennisappliance.com site here. The redesign was mainly for readability and access by regular users without the need for excessive scrolling to obtain vital information. Some upgrades include an admin section to hide/disable pages, edit content of all main pages, and change some basic settings of the layout. An additional contact form was added to the admin section for the owner to contact us for assistance in managing the site. Please do not contact Bill Ennis as this is a surprise. For references, contact us and we will put you in touch with Bill Ennis.